For the first time in probably 6 weeks or so, the temperatures are above 32 F. The sun is out, the temperature is about 37 F, and it feels positively balmy. Let's hope it doesn't melt too much. I'd much rather have uber-cold and beautiful than somewhat-cold and grey and slushy. 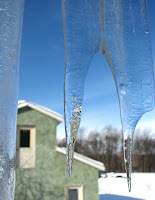 I love the icicle-as-frame! Also, it's definitely February when 37 degrees feels warm.